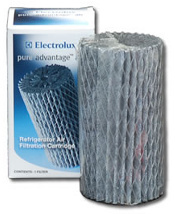 The Electrolux EAF1CB air filter for Frigidaire refrigerators. In order to keep the food in your refrigerator at its freshest, many refrigerators will use an air filter to capture contaminants and odors in the air. They're also very helpful in capturing the ethylene gasses emitted by fruits and vegetables, keeping them fresh longer. Some of these air filters may be built in to the refrigerator, depending on the model, like the GE FreshSaver GFSFR02 air filter cartridge. Similar to a refrigeratorâ€™s water filter, the air filter is made with activated carbon. For refrigerators that lack an air filter, there are literally hundreds of options for deodorizing a fridge. The best methods involve porous materials (like activated carbon) that easily collect odors and contaminants. For example, the Gonzo Odor Eliminator uses volcanic crystals and minerals that not only trap odor-causing particles, but also attract them into their container.